You’re invited to the Cheekd (iPhones ONLY) Mobile App Brooklyn Launch Party at The Brooklyn Brewery located at 79 North 11th Street, Brooklyn, NY. THIS EVENT IS ONLY OPEN TO IPHONE USERS–no exceptions. 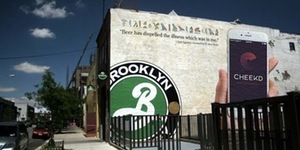 There will be an unlimited open Brooklyn Brewery Beer Bar & Nibbles from 7:30- 10:30 pm. Space is limited to the first 200 guests, so make sure you arrive early! You must have the Cheekd App downloaded, your profile filled out and your Bluetooth ON for entry. *All guests will have their IDs checked at the door. *iPhone Users only (with profiles filled out & BLUETOOTH on) will be allowed at the event. What’s Cheekd??? Cheekd is love and romance for people on the move. The app connects people in real time, versus virtual time. Connections begin in person; Cheekd helps you take the next step and continue the conversation online. It works on the train, a plane… anywhere. You’ll get a notification if someone who meets your criteria is within 30 feet of you. If you’re near a potential spark, Cheekd makes sure you know about it. Tags: beer, brooklyn brewery, cheekd, dating app, Free NYC. Bookmark the permalink.